At four in the morning on June 12, 2012, I drove down Cole Street in the Haight-Ashbury neighborhood of San Francisco, on my way to pick up a college intern carpooling with me to the California Academy of Sciences’ first citizen science tide-pool-monitoring expedition. The hour ranked as dead of night, but in this neighborhood, an imperfect Age of Aquarius is perpetually dawning. The date marked the lowest tide of the year in these parts, brought on by the moon’s position relative to the earth and the sun. This was the cosmic conjunction the intern and I were lining ourselves up with as we made a pretty straight shot twenty-five miles south to Pillar Point Harbor in Half Moon Bay, ahead of Silicon Valley traffic. My companion had a soft, ready smile even at this hour, and long blonde hair under a knit cap. I had determined our destination the old-fashioned way, by MapQuest, and following printed-out directions we arrived at the wrong beach. The intern cheerfully typed latitude and longitude coordinates into her smartphone and directed us by degree to the right one. Kids today! Citizen science is taking off as never before, and it is needed as never before. Scientists point out that while two million species have been named by science, millions more have yet to be discovered. At the same time, the sixth mass extinction crisis is taking out species before we even know they are there. What does it really take to save nature? How do we look at this gigantic problem? Citizen science starts with and continuously returns to individual observations of nature. Neither of us could have known it at the time, but it was possible she would never again have the opportunity to observe a giant sea star in its lair. The hermit crabs and brine shrimp we collected over the next three days of extra-low tides at Pillar Point would help embody a snapshot in time, physical reality as it existed in this moment on planet Earth. Every day our quarry would go back to the academy, where each thing would be officially named according to the age-old methods of taxonomy and suspended in jars of ethyl alcohol. Eventually they would be accessioned, taking their place among the twenty-two-million-and-counting specimens currently housed in vast metal cabinets in a temperature-controlled basement vault in the academy’s fancy building, designed by Renzo Piano, in Golden Gate Park. Thus they would join august company with specimens obscure and famous, including giant pink Galapagos iguanas brought back by Rollo Beck in 1906, and coelacanth fossils, thousands of years old, deposited at the academy in the 1970s. In the tide pool I was riveted by fat pink sea stars sitting like satisfied gangsters and seemingly unconcerned by their exposure; gulls would peck at them but the sea stars simply grew replacement limbs. I stared at one about a foot in diameter, with a six-inch crab stuck like a pottery shard glued by Julian Schnabel to its gullet. I was actually watching the sea star digest the crab. Later in the morning my intern friend crouched nearby. Like me, she was practically babbling with pure joy, pointing out this thing and that thing, and then, regrettably, she picked up a giant pink sea star. Only a very young person would think about physically interacting with this exaggerated form. She grinned at me, holding out her hand, draped with what I grew up calling a starfish. However, these creatures are not fish. Sea stars have an ancient lineage and strange, unique features. Their skeleton is wholly internal like our skulls, constructed out of stony, hard tissues called stereom. Their bizarre internal organs pump water through their bodies and move thousands of tiny tube feet for locomotion and eating. The intern decided to put the sea star back into the water, but it didn’t want to go. It clung with all those tiny feet to her skin like Velcro drenched in superglue. She was brave while I helped pull the sea star off her and plunked it back down onto its rock, seemingly unperturbed. “I’m never going to do that again,” she said. Neither of us could have known it at the time, but it was possible she would never again have the opportunity to observe a giant sea star in its lair. In June 2012, our team documented approximately seventy-plus sea stars in each delineated transect. A transect is simply a measured-out plot, sometimes square, rectangular, or circular, depending on the research question and the terrain. A year later, surveys turned up five to none in some transects. 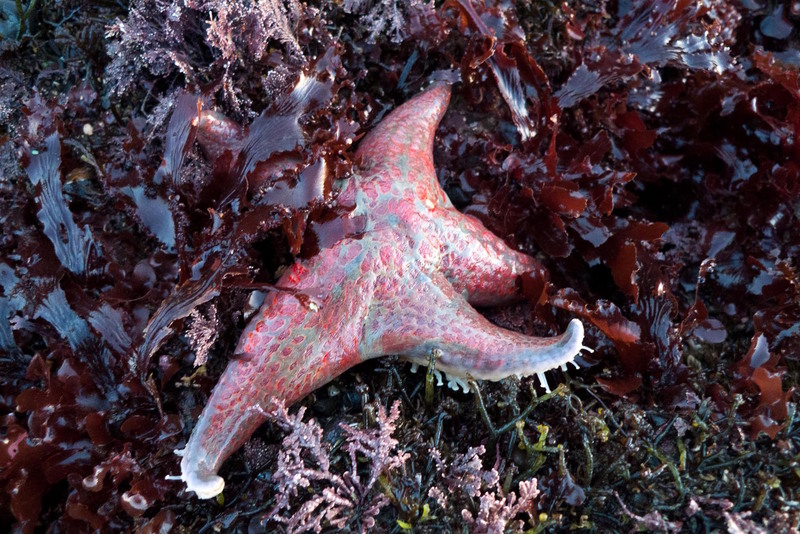 Citizen science is being deployed big time to help professional monitoring operations track the tide pools and figure out the epic affliction of twelve species of sea stars along the Pacific coast, documented from Sitka to Baja, Mexico. 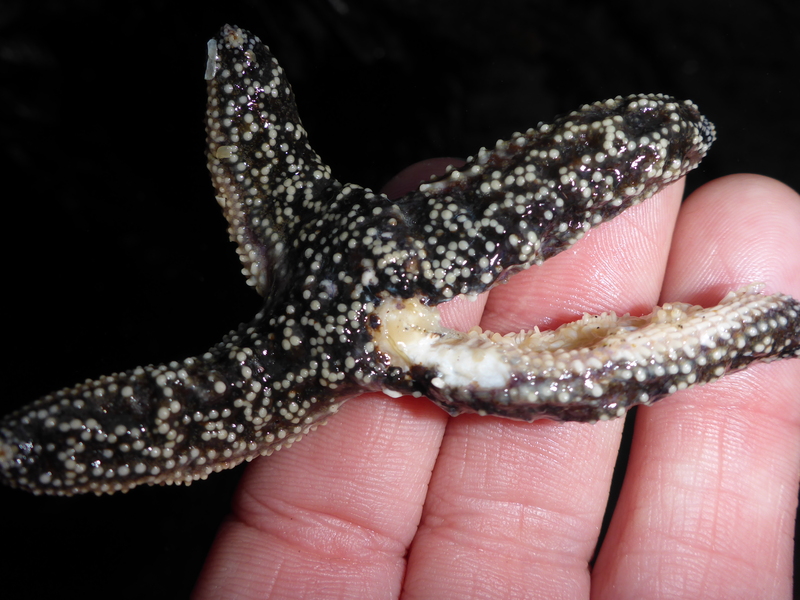 A sea star wasting disease is causing the biggest marine die-off yet known to human awareness. I first talked to Dr. Peter Raimondi, chair of the Ecology and Evolutionary Biology Department at University of California Santa Cruz, about the sea stars in March 2014, at which time he sounded fairly sanguine. After all, Raimondi had seen epidemic die-offs before. He had helped identify Candidatus Xenohaliotis californiensis as the cause of a “withering syndrome” that decimated black abalone in the 1990s. The bacterium attacks the abalone’s gut and it stops producing digestive enzymes. The die-off was severe enough that the black abalone has been designated an endangered species. So far there is no evidence of recovery in any of the affected areas, which are mostly in central California. The sea star die-off is of bigger dimensions than the abalone’s—orders of magnitude bigger. While one species of abalone has nearly been vaporized, twelve species of sea star are going away fast. The abalone’s range is fairly restricted, but sea stars have been observed falling apart and eventually disintegrating from Alaska to Baja. And while every denizen plays a role in the practically infinite complexity of tide pool interaction, the sea star is arguably the star of the show, figuratively as well as literally. As unrelenting as these creatures evidently are, sea stars play a critical role in keeping things balanced in the tide pool. By August 2014, the tally of sea stars dead and gone had reached the millions, and the disease showed no signs of abatement. The consolation of a known cause was not in sight. “It’s scary,” I said to Pete Raimondi. “Yeah,” he admitted. “It’s really, really creepy.” Raimondi may not want to call it the apocalypse, but since this is in fact the most extensive marine die-off yet known to contemporary history, the rest of us might at least want to call it a disaster. The term has a special resonance for the event, as dis is Latin for “apart,” and aster is “star.” The sea stars literally fall apart when they get this disease. Dis was a Roman god of the underworld, an association that flavors the term as if it were deity-ordained. On the upside, sea star wasting comes at a time when we can observe and monitor it as never before. 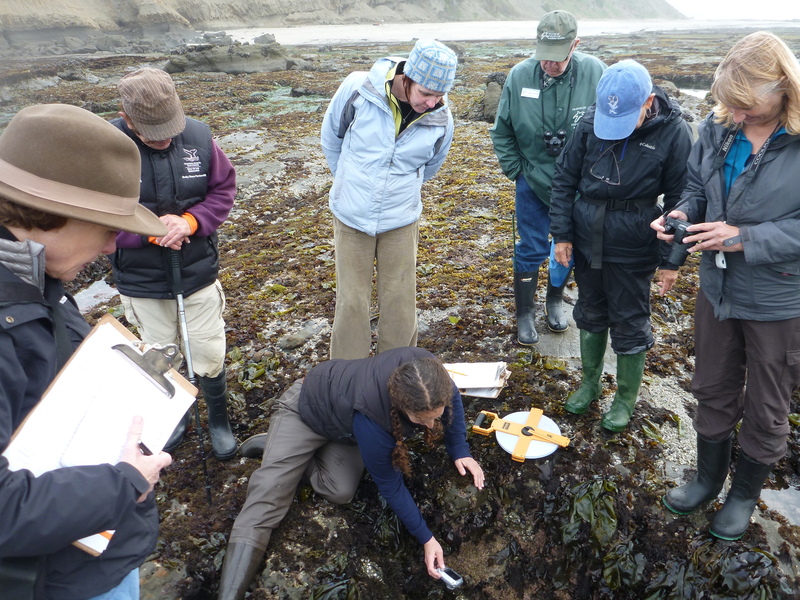 Pete Raimondi’s Pacific Rocky Intertidal Monitoring Program has been surveying marine diversity for more than twenty years, and incorporates data from a previous effort that goes back ten more. The program is focused on the collection of data in a uniform way by professional scientists across geographic areas, but in many places these efforts are augmented by citizen science. “It’s really a new addition for us,” UC Santa Cruz research specialist Melissa Miner told me. Miner has worked with Raimondi since the inception of the rocky intertidal program. “We’ve thought about it for a long time. We wanted to add some aspect of citizen science to what we do, because there’s huge interest in it. Some of our funders have been calling for it for a long time. But a lot of what we do requires expertise.” It’s hard to tell one species of sea anemone from another, and forget it when it comes to sea worms. “When the sea star wasting arose it became clear that this was a good way to involve people. On the open coast sea stars are pretty easy to identify. Sea star monitoring requires little gear and site setup is flexible. “Is this it?” I couldn’t help but persist in asking. Miner knew what I was talking about. In July 2014, the prominent journal Science had produced a special issue called “Vanishing Fauna” about the accelerating rate of species extinctions. It is possible that we will lose so many species that the way ecosystems operate will change, and not for the better. Loss of species can lead to accelerated rates of disease transmission from insects and birds, for example, to humans. Scourges like Ebola and Zika getting a faster ride on the conveyor belt between hosts. And one of a multitude of ongoing impacts on species loss could induce some kind of large-scale unraveling that would more directly threaten life as we know it. “Local extinctions” refers to populations and doesn’t mean the entire species everywhere goes away for good. But since “local extinctions” in this case refers to the entire West Coast of North America, the potential loss cannot be called anything less than staggering. The Pacific Rocky Intertidal Monitoring Program is now enlisting people to document juvenile sea stars. With data on how many young ones are populating the die-off areas, scientists may be able to figure out whether a recovery is under way. It sounded like good news that there are juveniles in many of the monitored tide pools. “But they are susceptible to the disease also,” Miner cautioned. So we will watch and see if they grow, or disappear. 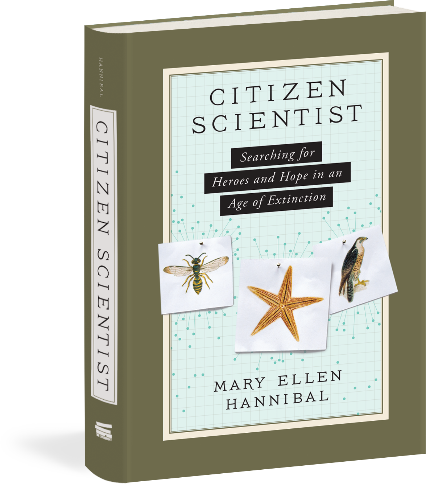 Excerpted from Citizen Scientist: Searching for Heroes and Hope in an Age of Extinction by Mary Ellen Hannibal. Copyright © 2016 Mary Ellen Hannibal. Published with permission of the publisher, The Experiment. Available wherever books are sold.